This menu card holder is a stylish display with a small footprint that can be placed on retail counters, cafe counter tops, jewellry stores, and restaurants without taking up heaps of space. The place card stands are made from brushed stainless steel, a durable stand that looks great in any location. 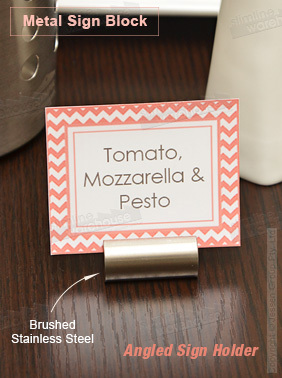 This menu card holder, like wedding table displays can hold cards and signs that are up to 1mm thick. The channel within the stand is angled so that signs are easy to read during display. This stainless steel wedding place card stand has a simple cylindrical design to provide a versatile display for use in any location. Check out our online catalogue by clicking here, your gateway to hundreds of different items in a variety of categories, with new items added weekly to help stay ahead of your competition! Slimline Warehouse has been a leading provider of goods for Australians for over 20 years, with our combination of high quality goods offered at low prices earning us a large customer base. Orders placed by 1pm EST will despatch same day with most in stock items to Melbourne, Sydney, Perth, Adelaide, Brisbane, & anywhere else in Australia!